Basketball Team Gifts for Girls. 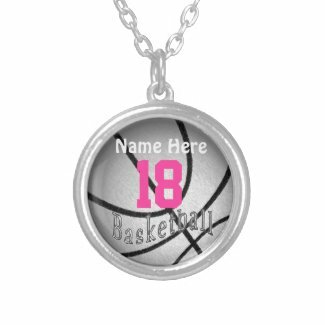 This Basketball Necklace with Name and Number (above) was the Top Selling Necklace out of over 1 Million Necklaces at Zazzle. Great Basketball Gift Ideas. That was out of ALL Necklaces, not just the basketball jewelry for girls and women. Basketball Team Gift Ideas with her Name and her Jersey Number. Thank you for helping me grow my little design business. I chose to design for Zazzle because of their outstanding quality of products and printing and their commitment to the best customer service. Very Cute Personalized Basketball Accessories for Girl. 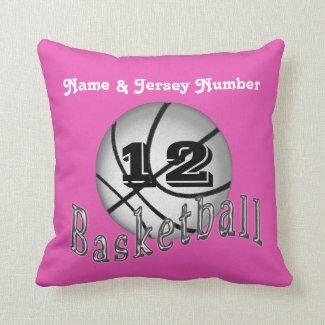 Girls Basketball Bedroom Decor with her NAME and her Number. Type in her Monogram instead of her Number if you wish or delete it completely. You can change the background color to ANY COLOR. Click the “Customize it” Button. Then under the “Customize it” area to your right of the basketball pillows, Click the “EDIT” drop down box. Then select your school color, your room decor color or any color box you like. Click “OK”. I can do it for you too. Unique and Personalized Basketball player Gifts for girls. Choose your Color of Watch Bands even mixing up the colors on this first Basketball Watch or choose another style all together. The second Basketball Watch is available in a white band or choose a different style. 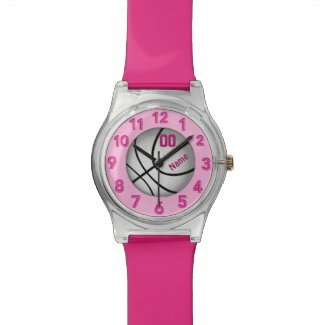 Lots of cool basketball watches, they make great Basketball Gifts for coaches, girls, women, fans and for everyone who loves the game. Girls Basketball Gift Ideas. I found some Photos of the old Women’s Basketball Uniforms from the late 1800’s and early 1900’s. Zazzle introduced Charm Bracelets and Rings. I can create matching gifts. CALL or TEXT me, Linda at: 239-949-9090. A+ Better Business Bureau Rated with a great 100% Money Back Guarantee if you don’t LOVE IT. Less than 1% of gifts are ever returned to Zazzle. See lots of personalized gifts for everyone. When did Women’s Basketball Start? 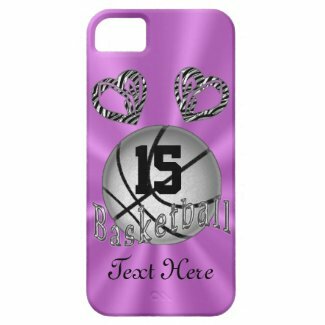 Girls love Pink Personalized Basketball Phone Cases for Girls. Personalized with Her NAME, JERSEY NUMBER, MONOGRAM or a special saying. Pink Purple color is so vibrant and pretty on the iPhone Basketball Cases. Purple and Pink Basketball Accessories for Girls is the perfect basketball gift ideas for girls and ladies. Wonderful and super cute Custom Basketball Gift for her. 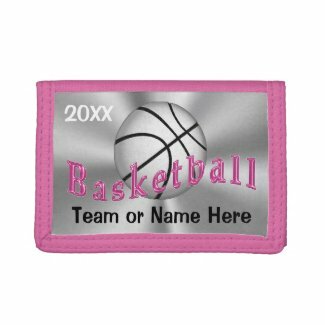 Cool Basketball Team Gifts and Basketball Accessories for Girls, they make great Gifts for that very special person. Coordinating Basketball Leggings for Women and Girls. Designed to go together or just buy one. Type in Your Jersey NUMBER and Text. She will be so proud to wear the Silver Basketball with her Jersey Number. How much fun will that be to wear your own Name and Number or Monogram on the Basketball Shirts for Women and Girls along with the perfect Basketball Accessories for Girls, Leggings. Delete any text you don’t want or change it to YOUR TEXT. 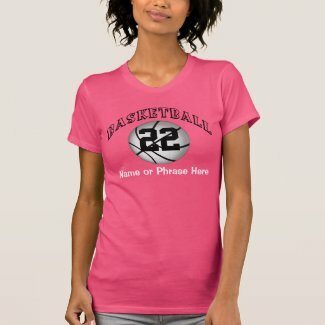 I designed a few combinations for the Basketball Shirts for Women and the Basketball Leggings with the cool silver basketball with your text and your jersey number or put your boyfriends basketball number on. If you would like me to create or customize any of these or other Basketball Accessories for Girls, please feel free to call or text Linda at: 239-949-9090. Cool Basketball Accessories for Girls and Ladies. Please Call or Text Linda at: 239-949-9090 for special order request or any changes to any of my designs. I can help you customize any of my Zazzle gifts. Just type YOUR TEXT into the Template Text Boxes to the right of each Basketball Gift. You can Highlight the temporary text and DELETE it too. If you would like me to create any of my gifts on a different Zazzle product. For instance, I can remake this Basketball Pillow into a Basketball Lumbar Pillow. Feel free to call with your requests. I don’t change a thing to create a design for you. I am just so happy you decided to shop with Little Linda Pinda Designs. CALL or TEXT me, Linda: 239-949-9090. Beginning 12-17-1974 was the very first contest featuring the women’s basketball team at Rutgers University. They defeated Princeton in Piscataway 76 to 60. Then in August of 1976 Thereas Shank Grentz was given the title of the women’s first full time Basketball Coach. She was the first women’s basketball coach in the entire nation. In March of 1980, they won their One Hundredth victory, 70 to 54 over Providence. They were in the FINAL EIGHT in March of 1980 with over 30 total points in the game with the Joanne Burke and June Olkowske. They ended the season with a 28 – 5 getting into the AIAW Nationals Final Eight. In March 1981 Kris Kirchner was named the KODAK ALL AMERICAN. She was the very first in Scarlet Knight basketball history for women averaging almost nineteen points a game and nine and a half rebound a games occuring in the 1980 to 1981 season. See this absolutely Amazing 9 year old varsity basketball player. This is High School Basketball at Downey Christian High School located in Orlando, Florida. Her father is the teams coach. Jaden Newman is a 4th Grader who is only Nine Years Old and she is already being looked at by a Colleges. University of Miami is trying to recruit the 4 foot 7 inch dyno – mite. Jaden has received a lot of national attention both on TV and the Internet. It will fun watching her grow up and see if her basketball talents keep rising to the levels she is at now. Go Jaden and Julian. Her mom says that basketball runs in the families blood. This is a little girl we will have to keep an eye on. Most people , 94% in a survey done on Good Morning America said she is too young for Colleges to be recruiting her. What do you think? I hope you have a chance to visit our Basketball Accessories for Girls and Gifts. Many Personalized Basketball Gifts for Girls, Boys, Men and Women. I’ve created lots of nice basketball coach gifts too. Here is her brother at 11 years old showing off his basketball talents. Very cool moves and it is funny watching the adults trying to do what Julian does so well. When asked, Who is the better basketball player, you or your sister, Julian sweetly and shyly answers, Me. These two basketball videos are fun to watch. Look at the dedication of these very young high achievers. It will be interesting to watch their future careers, likely in basketball. I personally think it build character and teaches kids discipline to allow them to play for school sports but at the same time, I also believe in the children choosing what activities they are interested in. I really was hoping my daughter would follow in my footsteps but she chose her own extra curricular activities. 239-949-9090 Calling or Texting is the BEST Method to get a hold of me. Call if you don’t hear from me. Unfortunately I get so many spam emails, I don’t want yours to get lost amongst all the rest. I love the new Basketball Mini Hoops. I created several for many sports. Put it over your waste paper basket to get your practice and keep things tidy. See lots and lots of Basketball Accessories for Girls by visiting our shop. See Link below. I’ve noticed many of my customers are not only from the US but also from Australia and England. Welcome and thank you so very much for choosing to shop with Little Linda Pinda Designs. 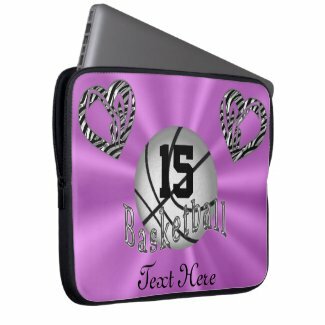 See many more Personalised Basketball Gifts for Girls, Boys, Men, Women, Fans and Coaches. CLICK HERE for lots more Personalised Basketball Gifts* thank you for stopping by. Feel free to call me if you would like me to create basketball gifts for your team with your team colors and messages.